Save us some strawberry nachos, please. 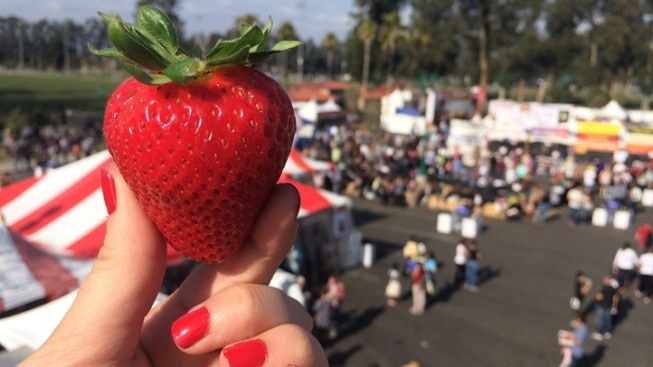 Strawberry nachos, strawberry shortcake, and fried strawberries are a few of the juicy favorites in Oxnard on May 21 and 22. SAVE THE STRAWBERRIES: Anyone who has ever made anything involving fruit knows just how precious five or six really ripe, extra large strawberries can be. If you're putting together a spinach salad, maybe with some piñon nuts or blue cheese, you're going to slice up those berries as thinly as possible, to make sure they're evenly distributed. If you're blending a smoothie, same deal; you'll throw the melon and bananas into the mix, with abandon, but the strawberries are precious and must be measured out, just to make sure you have enough for breakfast tomorrow. STRAWBERRY MEADOWS, in College Park in Oxnard. The agricultural hub will again host the carnival-fun, recipe-intriguing shebang on Saturday, May 21 and Sunday, May 22. There's the "Berry Blast-off" recipe contest, which marks its 8th year in 2016, the ever-popular contests including the Tart Toss, a Pie-Eating showdown, and the Strawberry Build-Off. And as for consuming all of the green-topped, seed-mazing, bright-flavored strawberrynes you want to, without having to save a few in the produce drawer for tomorrow night's dessert? Check it out: "An estimated 1.5 million strawberries will be consumed over the weekend.." Good stuff, and even better: Many food booths are non-profits, so consider that your tasty strawberry dish, and the money you paid for it, is moving on to help someone else. Nothing, not even a strawberry, is as sweet as that.